The evolution of 3D NAND memory had enabled storage device makers to offer rather unprecedented capacities. To that end, this week at Mobile World Congress, Micron and Western Digital their first 1TB microSDXC cards, marking the point where the pint-sized storage cards have become too big to be measured in mere gigabytes. Besides offering loads of storage space, the cards also feature SD Association’s A2 capabilities and support running Android applications directly from the card. The c200 1 TB microSDXC card from Micron and the SanDisk Extreme 1 TB microSDXC card from Western Digital are based on 96-layer 3D NAND flash memory from the respective companies as well as controllers designed in-house. Both cards are also compatible with existing SDXC hosts. While Micron confirms that its card uses 3D QLC NAND, Western Digital is somewhat reluctant to disclose the type of memory it uses. It is logical to assume that the SanDisk card also uses the company’s second -generation 3D QLC NAND devices, but this information is not official. Moving on to performance offered by the products, both cards support the A2 app performance class specification. This means they can provide random performance of at least 4000 read IOPS and 2000 write IOPS, as well as support for such capabilities as command queuing (with a minimum depth queue of 2 and a maximum depth queue of 32) to optimize random read performance, caching to hit write performance targets, as well as self-maintenance capabilities. 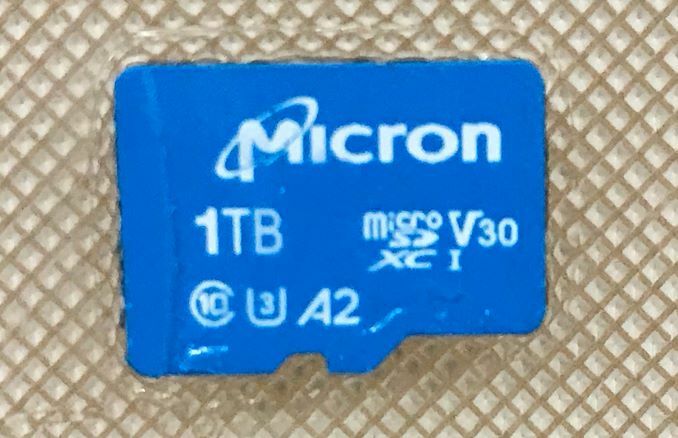 Micron says that its c200 1 TB microSD card is capable of up to 100 MB/s sequential read speeds as well as up to 95 MB/s sequential write speeds. The card also supports the V30 video speed class specifications, so this means its minimum write speed is at least 30 MB/s. Meanwhile for their part, Western Digital says that its card is capable of 160 – 170 MB/s read/write speeds, which makes it the "world’s fastest microSDXC 1 TB UHS-I card." There is a catch though: the UHS-I bus only supports up to 104 MB/s throughput, so SanDisk Extreme 1 TB microSDXC cards can only hit the advertised speeds on hosts supporting DDR-200 transfer rates. While there are some smartphones that can do this, it is usually not advertised. So in the vast majority of cases the card will hit the maximum that the bus offers: around 100 MB/s reads and writes. Meanwhile, the card also carries the V30 badge and its minimum write speed is 30 MB/s. Western Digital plans to start selling its 1 TB microSDXC card in April at a price of $449.99. As is usually the case for storage products, this is a bit of a price premium for the top capacity model; by comparison, WD's 512 GB microSDXC product costs $199.99. 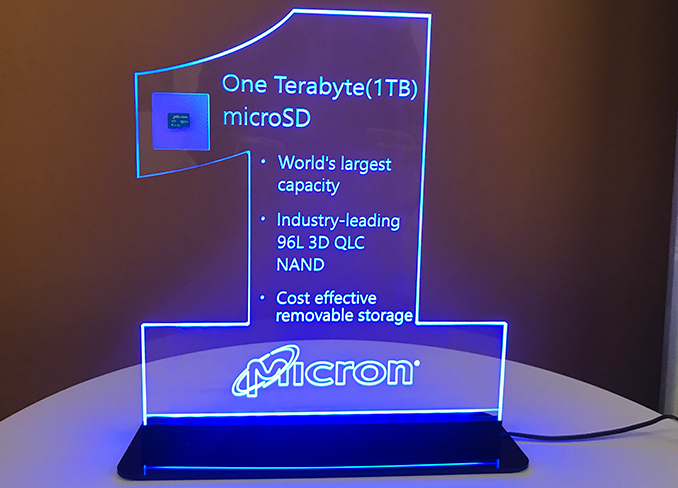 Meanwhile Micron does not disclose MSRP of its 1 TB microSDXC card, but the company indicates that it will be “competitive for the target audience”. The product will be available sometime in the second quarter. That makes for 7800x the capacity of early 128MB microSD cards. 7800x improvement with the same physical media. 3.5" Floppy disks, on the other hand, went from 1.44MB to 2.88, but no one used 2.88. Looks like wiki was already correct.